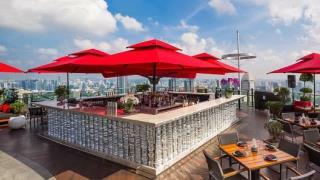 (Newser) – In the ultimate act of lavish absurdity, Singapore restaurant Ce La Vi is partnering with Russian company World of Diamonds Group to offer what is being billed as the "most expensive dining experience in the world." It's one only two worthy diners will have the chance to experience at a date that Mashable reports has yet to be specified, though the site references an August press conference that will ostensibly precede it. The companies will select the chosen duo, and what unfolds over the course of the eight-hour affair may actually make the $2 million price tag something of a bargain. A 45-minute helicopter ride over Singapore kicks things off, at which point the pair is escorted via a Rolls Royce to a private luxury cruise, reports Forbes. They are ultimately transported to Ce La Vi, which offers 360-degree views of the city from its perch atop the Marina Bay Sands Hotel. They gotta be kidding!!! Who the eff would sit thru a 12 hr "meal"? "Slow cooked pigeon" sounds more like a description of the fool who buys this offering. A Jane Seymour ring? Jane Seymour seems like a lovely person, and makes some nice jewelry for Valentine's and Mother's days, but, not exactly the epitome of classy jewelry. Gold plated platinum? Couldn't they afford the gold? Maybe they could save some money and cut down the amount of roses. Who in their right mind plates platinum? What about a Tiffany ring, or one from Harry Winston's collection? This sounds like an event aimed at some rube couple who just won the lottery and might not yet know what does and doesn't have real value. Then again, it's perhaps planned by someone who might not know what does and doesn't have real value. After about a few vases of a dozen roses each, well-placed in the environment, the number of roses at 10,000 is excessive and just a waste of roses. You wouldn't be able to appreciate the taste of the wine, from the smell of the roses. Your nose would be overwhelmed. You might as well just eat the rose petals because all 18 courses will taste like them. Actually "smart" people with that kind of money don't waste it on stupid scams like this. For two million you can buy allot of things including items that would actually make you money in return.